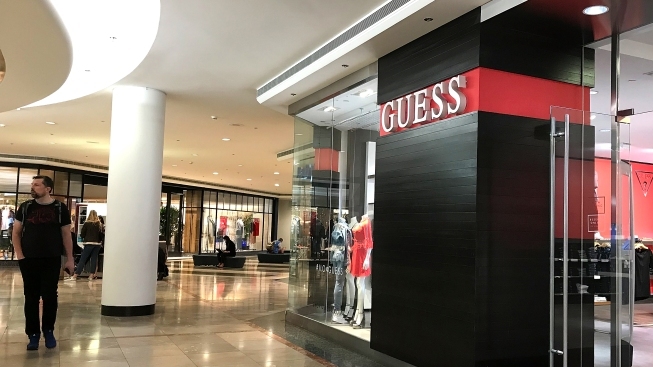 FILE - A shopper walks by a Guess store on Feb. 1, 2018, in San Francisco, Calif. Fashion designer Paul Marciano resigned as board chairman of Los Angeles-based clothing retailer Guess in response to sexual harassment allegations, but he will remain on the board through January, according to a document filed today with the Securities and Exchange Commission. Marciano was the target of allegations by several women, including model Kate Upton, who said in February that he groped her chest during a photo shoot with the company in 2010, when she was 18 years old. In the SEC filing, company officials said many of the allegations against Marciano "could not be corroborated." "In some cases, no conclusion could be reached because the individuals either declined to be interviewed or provided insufficient information to investigators," according to the document. "And, in other cases, the investigation found that credible accounts were given by both sides. The investigation found that on certain occasions, Mr. Marciano exercised poor judgment in his communications with models and photographers and in placing himself in situations in which plausible allegations of improper conduct could, and did, arise." According to the filing, Marciano notified the board on Monday that he would resign as chairman. His brother, Maurice Marciano, was chosen by the board to replace him as chairman. Paul Marciano is expected to remain with the company through the balance of his employment contract, which runs through Jan. 30, 2019, according to the document. "Allegations against Mr. Marciano included claims of inappropriate comments and texts, and unwanted advances including kissing and groping," according to the company. The filing notes that the company has paid a total of $500,000 to settle allegations brought by five people against Marciano. Woodland Hills-based civil rights attorney Lisa Bloom said she represented four of the five women who alleged wrongdoing by Marciano, and they received a total of $400,000. She wrote on her Twitter page that she was "delighted" at the news, but said Marciano should not still be serving on the company's board. "In my opinion, a man with this many allegations of sexual assault is not fit to remain on the board of (Guess), a women's clothing company," she said.